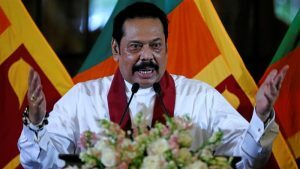 A Sri Lankan court has barred former President Mahinda Rajapaksa from acting as prime minister as it hears a petition challenging his refusal to step down despite losing two no-confidence motions last month. Judge Arjuna Obeyesekere issued the stay order on Monday, saying “irreparable damage would be caused” if Rajapaksa and ministers of his cabinet continued to hold office. The Court of Appeal will sit again on December 12 to deliver a verdict, he said. Sri Lanka has been in crisis since October 26 after President Maithripala Sirisena sacked Prime Minister Ranil Wickremesinghe and replaced him with Rajapaksa, a controversial but popular leader accused of corruption and grave human rights abuses. But the former president failed to show a majority in parliament, prompting Sirisena to call snap elections after dissolving the 225-member House altogether. Both moves, however, were temporarily blocked by the Supreme Court, which is expected to deliver a verdict on December 7. There was no immediate comment from Rajapaksa on Monday’s decision. Some 122 legislators voted to remove him on November 14 and 18, saying his appointment was against the constitution as parliament had stripped the president of his powers to sack a sitting prime minister. But both Rajapaksa and Sirisena rejected the outcome of the no-confidence votes, claiming the speaker failed to follow proper procedure by holding voice votes. Wickremesinghe, who continues to lay claim to the post of prime minister, hailed Monday’s stay order as a “triumph of democratic institutions over the whims of individuals”. The leader of the United National Party (UNP) remains holed up in the prime minister’s official residence and insists he has majority support in parliament. The UNP, which has the support of more than 100 legislators, last week said Wickremesinghe was still their nominee for the prime minister’s job. R Sampathan, leader of the Tamil National Alliance, a coalition representing the country’s ethnic Tamil minority, said he met with Sirisena following the court’s decision, and the president had promised to take “necessary action within the next 24 hours”. In a Twitter post, Sampathan said Sirisena accepted that Sri Lanka no longer had a government and that he intended to meet with national security officials. Meanwhile, many Sri Lankans took to social media to celebrate the court’s move. Sagala Ratnayake, a UNP member, also welcomed the decision, saying “justice has prevailed”. Saliya Peiris, who heads a commission to trace the tens of thousands of people who went missing during Sri Lanka’s 26-year-war with Tamil separatists, said the stay order on Monday “was a proud moment for all those who value the Rule of Law and the independence of the judiciary” in Sri Lanka.